Joan Lingard is one of those writers with a considerable body of work, who just gets on with the craft of writing, whether it is for Children, or Adults. Encarnita’s Journey starts of in Edinburgh, where Encarnita, and her daughter Concepcion are looking for work, before really starting in 1920, at the very moment of Encarnita’s birth, in a paragraph that is not for the squeamish. Throughout her childhood, growing up in Yegen, in the shadow of the first world war, Encarnita’s life takes on many different colours, from dealings with real life figures such as Lytton Strachey, Dora Carrington, and Virginia Woolf. 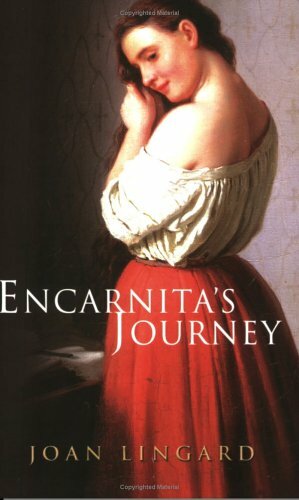 Although Encarnita’s life is actually pretty uneventful (she has a child, a number of jobs, that change due to economic forces, loses lovers and family members) it is the detail that make Encarnita’s Journey such a good read, from the research that went into the names, setting the time lines and places so that she would have met the real people that are mentioned, to making the whole book read as a believable, worthwhile life. Although the changes that are bought by war are felt, and there are elements of sadness, and pathos, as there is with every book of this nature, there is also a resounding sense of hope, of discovery, which is what sets Encarnita out on her journey, to live the life she has been given, and to find out all that she can in a world that is always changing. Interesting intrigue in a review.